Why Did We Never Get the Saga of the Vengeance of Thor? In Nothing Was Delivered, we look at announced comic book projects that never came about. We'll try to find out WHY they didn't come out. I'm sure you all know tons of examples of comic book projects like these, so feel free to write me at brianc@cbr.com to tell me some for future columns. Today, based on a suggestion from reader Jason M. (and a story I featured as a legend years ago), we look at the could-have-been-classic "Thor" event, "The Saga of the Vengeance of Thor"! 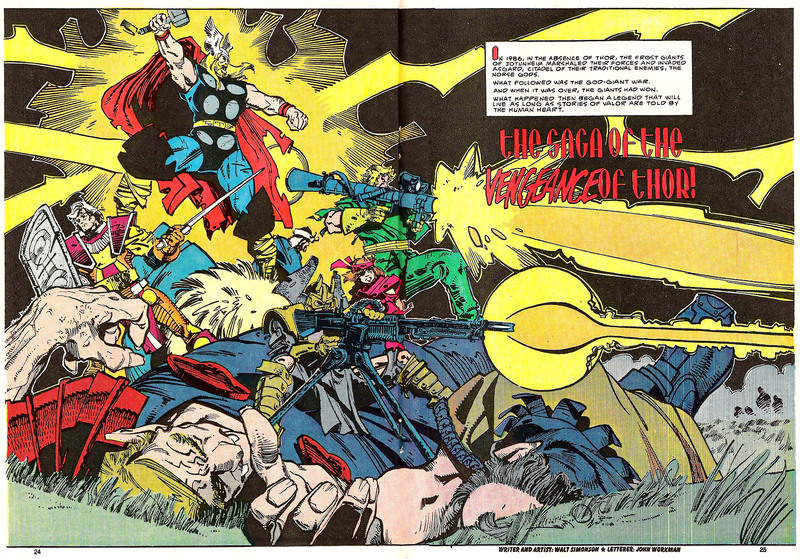 As Jason noted, in "Marvel Age Annual" #6 from 1986, we got the following spectacularly awesome looking preview image of a supposedly upcoming "Thor" storyline from Walter Simonson's epic "Thor" run called "The Saga of the Vengeance of Thor." That story never actually took place. I had planned on doing a god/giant war involving many of the characters I was playing with at the time but got off the title before that storyline ever came to fruition. It’s possible–but I don’t remember now–that parts of the storyline of my final THOR plot were ‘borrowed’ from that original idea, although clearly, I didn’t use Hildy (shown in the annual drawing) and I’d obviously had additional ideas about using mortal weapons in that storyline. Too bad. Oh well, maybe some future writer can still do the idea! Jason Aaron has been on "Thor" for a long time now, maybe he can someday! Thanks to Jason for the suggestion! If anyone else has an idea for an announced project that never materialized that they'd like to learn more about, drop me a line at brianc@cbr.com!